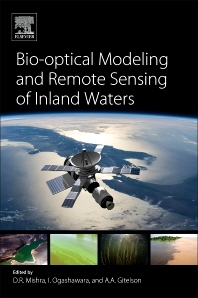 Bio-optical Modeling and Remote Sensing of Inland Waters presents the latest developments, state-of-the-art, and future perspectives of bio-optical modeling for each optically active component of inland waters, providing a broad range of applications of water quality monitoring using remote sensing. Rather than discussing optical radiometry theories, the authors explore the applications of these theories to inland aquatic environments. The book not only covers applications, but also discusses new possibilities, making the bio-optical theories operational, a concept that is of great interest to both government and private sector organizations. In addition, it addresses not only the physical theory that makes bio-optical modeling possible, but also the implementation and applications of bio-optical modeling in inland waters. Early chapters introduce the concepts of bio-optical modeling and the classification of bio-optical models and satellite capabilities both in existence and in development. Later chapters target specific optically active components (OACs) for inland waters and present the current status and future direction of bio-optical modeling for the OACs. Concluding sections provide an overview of a governance strategy for global monitoring of inland waters based on earth observation and bio-optical modeling. Mishra’s research expertise is in the area of application of geospatial science to monitor environment particularly vegetation and water resources in the southeastern U.S. His research on radiative transfer model and water column correction procedure to map underwater coral reef habitats from space have been citied in numerous journal articles and replicated by many researchers and resource managers. His research on predicting toxic algal growth (cyanobacteria) and phytoplankton in inland waters has attracted attention of agencies such as GA Power, EPA, and Center for Disease Control. Mishra currently serves on the Editorial board of two international journals, GIScience and Remote Sensing and MDPI’s Remote Sensing, and is an active reviewer for 34 international journals. He edited a special issue for GIScience and Remote Sensing during 2013 entitled “Coastal Remote Sensing” which was published in early 2014. Currently, he is co-editing two special issues entitled “Remote Sensing of Water resources” and “Remote sensing in coastal environments” for MDPI’s Remote Sensing. Geographer by degree and limnologist by heart Ogashawara found through remote sensing the opportunity to connect these two areas. Since high school he learned about tropical limnology while researching at the International Institute of Ecology, Brazil. During college he worked on relating weather types and cyanobacteria blooms and as an MSc student at the Brazilian National Institute for Space Research, he attempted to use bio-optical modeling to monitor water quality in tropical hydroelectric reservoirs. Currently he is a PhD student at Indiana University – Purdue University at Indianapolis, working with bio-optical modeling to identify and predict cyanobacteria in inland waters. Gitelson’s expertise is in the area of remote sensing of aquatic and terrestrial environments. His research on radiative transfer in terrestrial vegetation and water resulted in development models for estimating water constituent concentrations and pigment contents in vegetation. They have been citied in numerous journal articles and used widely around the world. He has published more than 150 papers in peer-reviewed journals (http://calmit.unl.edu/people/agitelson2). Gitelson serves on the Editorial board of several journals, Remote Sensing of Environment and Remote Sensing are among them.